This may look familiar. It is similar to another painting I did a couple of years back (and included in my "Bella Italia, Italy through the Eyes of an Artist" book), but I had a request from a gallery to make a larger version. One of my goals for this year and next is working larger so it was right in line with the direction I've been pursuing. 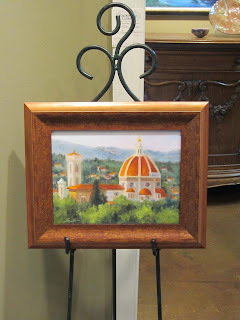 A fun way to end the year, painting memories of travels to Tuscany. Happy Holidays to all and may 2014 be your best year yet! 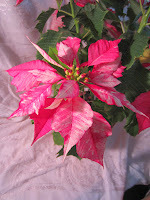 While I have some beautiful live poinsettias from Pikes here at home, I decided to do a little study of one of the pink and white variegated ones today. Poinsettias, holly and other traditional holiday plants and flowers can do a lot to really dress up a home or business and make it feel festive this time of year. "To add some beauty to your home for the holidays in a simple and easy way: Save the trimmings from the bottom of your tree and place them on the mantle. They do not have to be in water as they will dry a nice shade of green and still add that wonderful fragrance to your home. 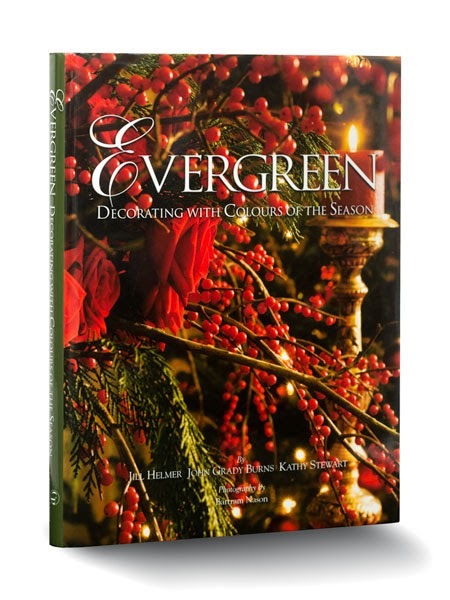 If you have access to some holly shrubs or trees just cut several branches and place them in a vase. A mass of one type of greenery (holly in this case) always makes a statement. If you wish you could easily pick up a few stems of red roses or red carnations (large or miniature blooms) and add to the holly arrangement when you have guests in your home. Simple and easy is what we like..."
Someone recently asked if I had a youtube video of my approach to oil painting and I don't (yet) but will share at least some photo's of a progression of an oil painting to show how things unfold. The person who was asking me is learning using a classical approach with grids and layers etc.. so I shared that my approach is quite different from that- it's more free flowing and alla prima. Unless there is architecture or specific man-made shapes in my subject matter, I don't do too much drawing upfront. Instead I first block in large shapes with transparent paints only. The come back and further resolve specific areas. It's kind of messy and organic and if I did the same painting again I might do things in a different order, but that is part of the fun and challenge of it. To extract something of beauty from something that starts out kind of a mess. Like Michelangelo said, I started with a block of marble and took away everything that wasn't David. After the block in stage which is very rough, I know there's something in there, I just need to pull it out with shapes and colors of paint. Many years ago I read an article in one of the art magazines, and forgive me for not remembering and crediting the author, but I recall her saying "every painting has to go thru an ugly stage". That really stuck with me, because it seems true. There is a point in every painting where it's a mess and you think "this will never turn out". If you listen to that little voice in your head, that judgement will make you want to quit. But knowing that that ugly stage is something to expect and a natural part of the process allows me to go on and follow thru to create something more in line with my original intention. So the moral of the story; don't stop till it's done. Raining for the 8th straight day here in Atlanta. Wishing for the return of sunnier days like this one inspired by a photo and memories of a lovely garden in Alabama this past spring. At least I can imagine that and be taken back there with my painting. 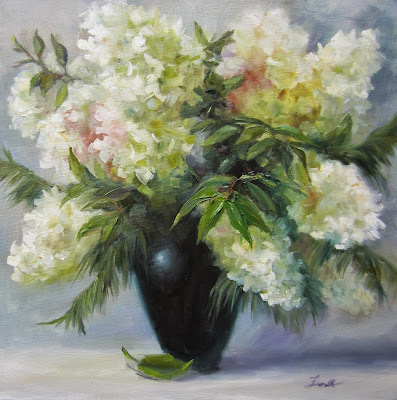 Each month I offer "Bringing Beauty to the World" where I share art, news, upcoming workshops, special invitations and inspiration about life, art & beauty. If you are not receiving my monthly newsletter and would like to do so, you can click to see a copy of the December issue and sign up to receive it free via email in the right column of this blog. Just completed a much larger, more detailed version of an earlier study based on one of the photo's taken during a workshop I did with Ovanes Berberian in France earlier this year. The flowers were set up outside against a stone wall. The small 6 x 8 study and the original photo reference are posted below. Every piece of art reflects the artist's choices- what to include, delete, emphasize. 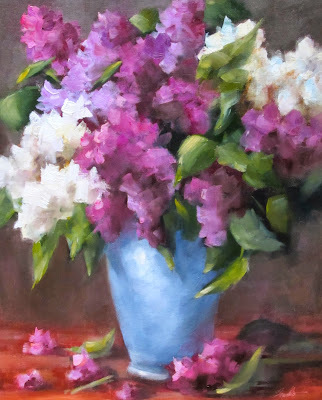 In the small study I was focused on the light and shadow of the flowers and pot and totally changed the background to keep it simple. 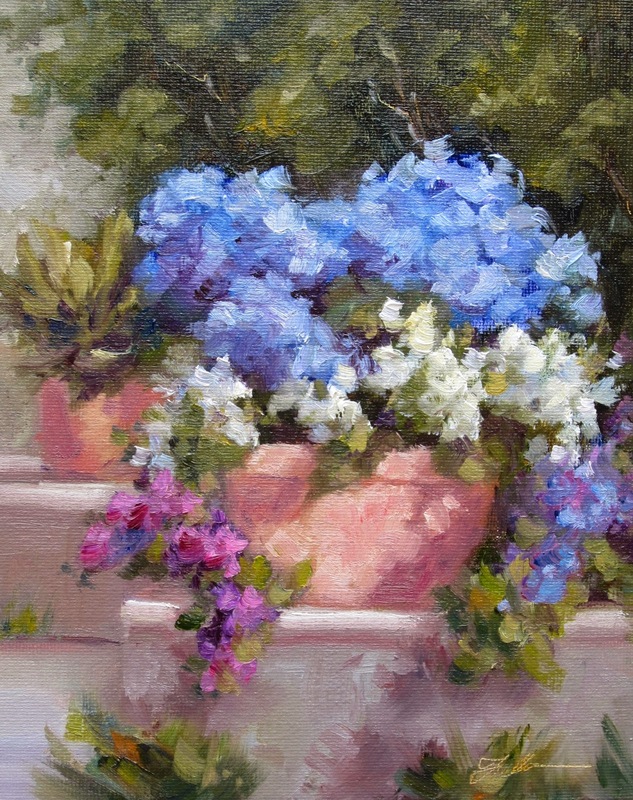 In the larger painting, I still eliminated the plants from the background, but wanted to at least suggest the stone wall and focus more on the distinctive shapes and form of the flowers. Funny, after nearly 3 months I did not remember the name I had put on the small study when I posted it back in September. When I just went back to check it, I see that it is called Fresh Morning. The new one is called Fresh. Probably no coincidence. That's how I feel about monochromatic groupings of white flowers against green leaves- it has a feeling of freshness to me. At Thanksgiving, we are especially aware of all the things in life we are thankful for. 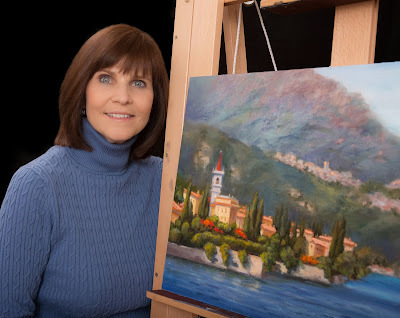 In addition to family, friends, health and some many other things, I am very thankful to have developed a passion for art and have had the opportunity to travel to many beautiful places to paint over the years. 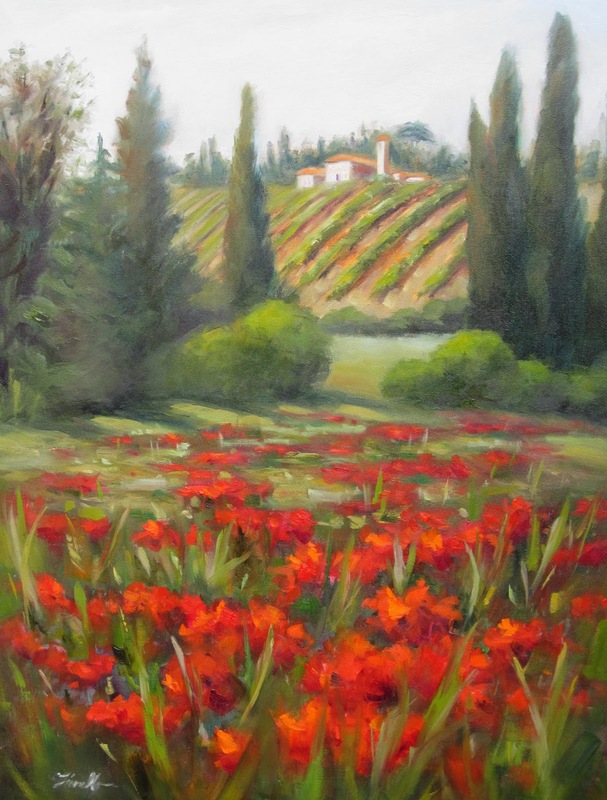 If you are ready to create something truly special to look forward to in 2014, you may want to join me for a week long painting adventure in Provence, France May 17-24.
part in this very special growth experience. All skill levels and any mediums are welcome. 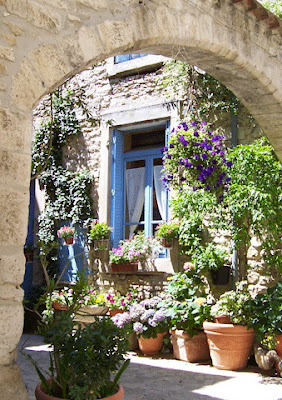 Immerse yourself in painting, beauty and fun during this week long escape to France! If interested, please contact me ASAP as there is still time left to take advantage of the "Early Bird registration" discount which ends November 30. I'm reading the absolutely wonderful book, Alla Prima II by painting legend Richard Schmid. I originally was not going to get the book since I have the original Alla Prima book which was first published in the last 90's. That book is excellent and has long been held as the bible of painting. However I took a closer look and saw that a lot had been added and updated so I got the new version and am glad that I did. The book is like eating a rich gourmet meal for artists. It is filled with gems of wisdom and perspective as well as more practical information and includes quite a bit more than the original book. One interesting thing to see in comparing the 2 books is how far printing has come in that time. 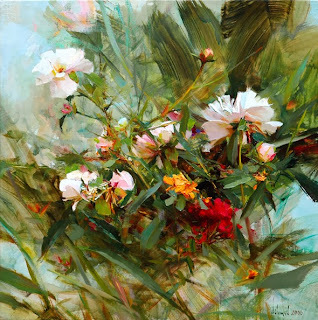 The level of richness of color, detail and brushstrokes visible compared the the first is simply amazing. I compared several painting in the first version to the current and there is no comparison. While the paintings were beautiful in the first book, they are so much closer to what I imagine the actual paintings look like in the second. In the spirit of "painting the masters", I took one painting, greatly simplified it to try to get the feeling and approach. That is the study above. Richard's version is below. I learned a lot by doing even this quick study which was fun and felt pretty natural even though the process is different than my usual approach. I like the feeling of it and will continue to experiment with it to have another option in my painting tool kit. Just finished this last night. 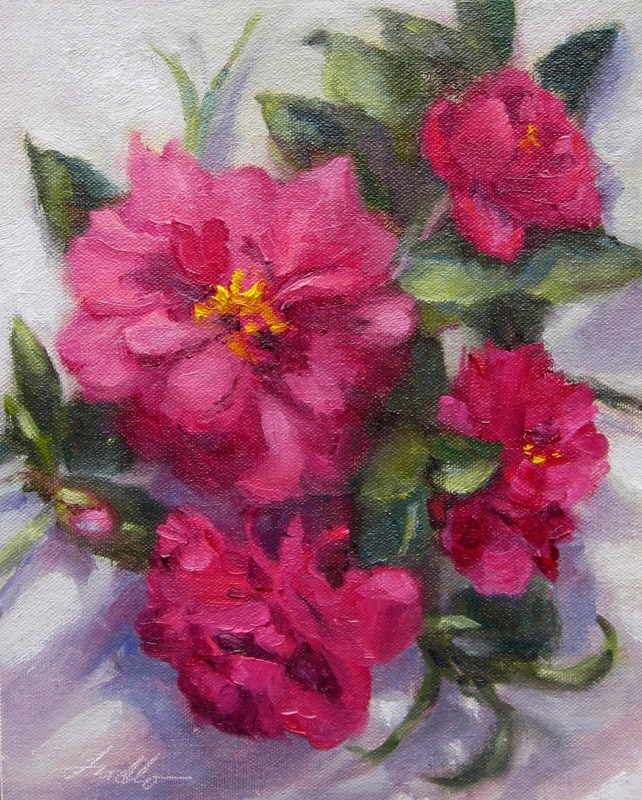 I call it "Camellia Love" since it was inspired by Camellias from my garden which I arranged into a table top still life. The Camellia part is obvious, but the Love may not be. I titled it Camellia Love because the flowers are from my garden. I don't have much of a green thumb, but my husband Peter has been working for many years to continually upgrade our garden with new and different plants and flowers. He aways reminds me he is doing all this work for me- because he knows how happy the flowers make me- it's one of his expressions of love. (and lots of sweat equity), to let him know how much I love and appreciate him and all that he does for me (I hope you're reading honey!). Haven't been posting as much lately because I'm working on several holiday commissions that are going to be gifts so don't want to spoil the surprise so I will wait to share them till after the recipients have gotten them. 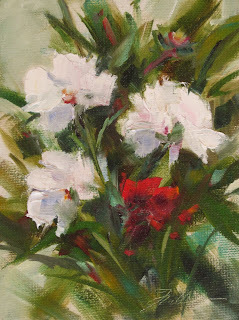 In the meantime I did have a chance to buy some carnations and work on this painting "Carnations in Red". Also wanted to send a big THANK YOU! to Cornelia Powell for featuring my bridal bouquet commissions in her blog "Letters to a Bride" on November 11. Cornelia is a long time friend and wedding expert, working with brides in many capacities over 30 years to ensure that their special day is filled with beauty, tradition and meaning. In her new Amazon best seller book, The Bride's Ritual Guide: Look Inside to Find Yourself, Cornelia takes the old bridal rhyme, “something old, something new, something borrowed, something blue, and a sixpence for her shoe,” and turns it into a magical reverie for the modern bride. Called a “wedding folklorist,” she shares ways to bring more ease, pleasure and reassurance into a woman's life not only as a bride, but through all her rites-of-passage. It's hard to believe another year is winding down. Just 3 weeks till Thanksgiving. For the past 12 years, I've held an annual Holiday Party and Studio Sale the first Friday in December. This year's party is Friday December 6, from 6-10pm. If you are in the Atlanta area, you are welcome to join us for some food and wine and fun with old friends and new. You can also visit my art studio and see what I've been up to this year. The address is 341 West Wieuca Road NE, Atlanta, GA 30342. Hope you will be able to join us. Feel free to bring a spouse or friend. Please RSVP to Pat at patfiorello@aol.com if you plan to attend. P.S. 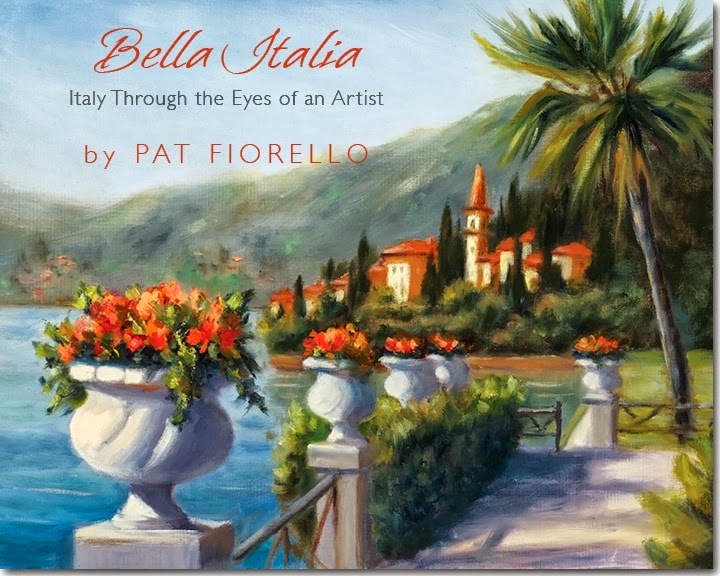 If you are looking for a holiday gift idea for someone who loves art &/or travel, consider a copy of my book "Bella Italia, Italy Through the Eyes of an Artist". The book is $35 plus $5 shipping and can be purchased here. If you want a sneak peek of the 120 page, hard cover book, click here for an excerpt of a few selected pages. I was recently at a conference in Charlotte North Carolina. This elegant bouquet of hydrangeas, roses and snapdragons in a crystal container was on the stage all weekend as part of the decor. I couldn't help noticing it and sneaking in some photo's during a break. Of course the lighting was not ideal and there were other things on the table like coffee cups, a water bottle and extraneous objects, but I improvised and removed those items and added a few roses on the tabletop for interest. Intensified the colors too for a more exuberant feeling. With the benefit of cameras in our phones now, we can capture bits of inspiration wherever we are. Last week I was working on a painting of Monet's Garden. I started using a different approach than I typically do. Instead of laying down transparent colors I started with darks all over then lifted away the lights. I wasn't too happy with how it was coming along but wasn't quite sure what was missing. But instead of struggling with no direction, I went back and did another version with the approach I use most often and completed that one which I shared in my post on 10/23. With that one in hand, I went back and compared the 2 and was able to see how to continue on with the first version. The revised version 1 is shown here. Often finding a solution is not a direct path as in the case of this painting. The other day I came across an excellent video by BBC where philosopher Roger Scruton presents a provocative essay on the importance of beauty in the arts and in our lives. Here's the link if you are interested in learning more on the subject: Why Beauty Matters. Enjoy! 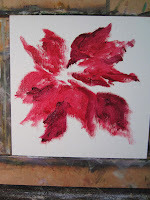 Several years ago, I taught a painting workshop at Monet's Garden in Giverny France. It's a beautiful, magical place, sometimes referred to as a "riot of color." I worked on this small painting of one of the bridges covered in Wisteria today. Actually, it's my 2nd attempt. I started another version last week. Was not happy with it, but not quite sure what needed to be adjusted. Had tried a new approach putting in darks and wiping out lights, but wasn't pleased with it. So today rather than be stopped by that one which I felt a little stuck on, I decided to do a fresh painting of the same subject with the method I typically use- transparent color underpainting, followed by opaques- as access to possibly discover what is missing from the first one. Now that I got a better handle on this fairly complex and busy subject with the method I normally use, I am going to go back to the first version and see what needs to be adjusted to bring it to a finish. Will keep you posted on what I learn. 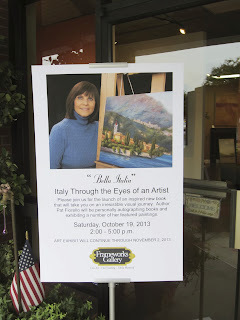 In other news, this past Saturday was my first official book signing for my new book "Bella Italia, Italy Through the Eyes of an Artist". 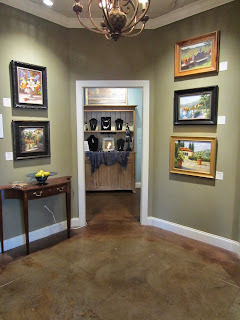 The event was hosted by one of my galleries, Frameworks Gallery in Marietta, GA in conjunction with a show of about 25 of the 80 paintings that are in the book. The show goes thru Nov 2. 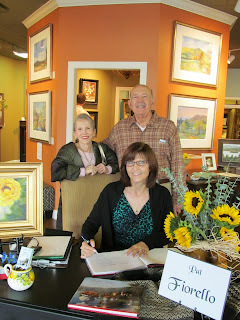 My thanks to the many friends, collectors and new acquaintances that came by. 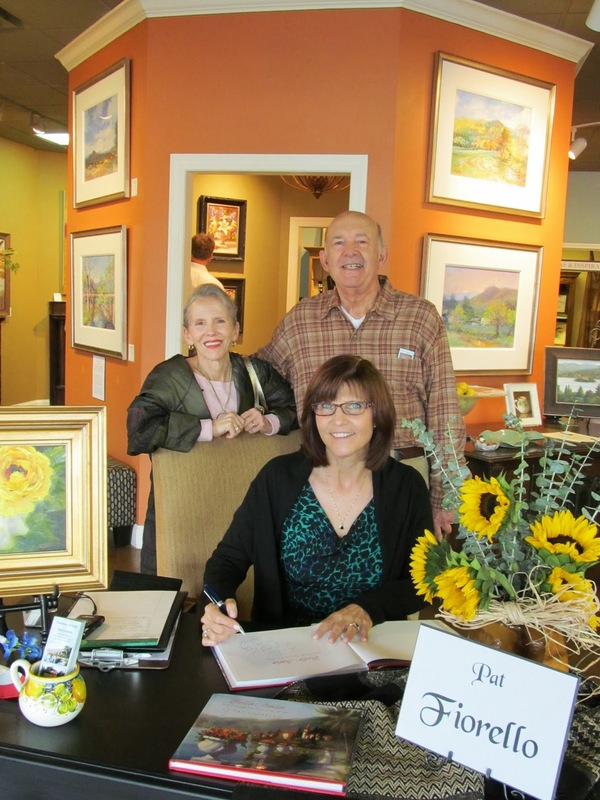 Special thanks to Sunny, Diane and Jean of Frameworks Gallery for being our gracious hosts and doing a beautiful job, as always, on the framing and displaying of the artwork. Many of the paintings included in the book are already sold, including the painting on the cover of the book which just sold this weekend, but other beautiful images of Italy are still available. I am offering a free personalized signed book with the purchase of any painting during the duration of this show, so you are invited to visit the gallery to take a look. If you'd like a signed copy of the book for either yourself or as a gift, click here to order and one will be on it's way to you. 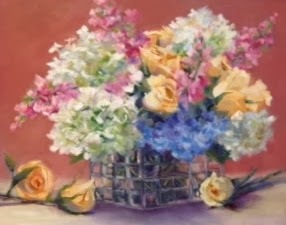 I took another small study (6 x 8) done during last month's 30 in 30 challenge and scaled it up to a much larger (16 x 20) interpretation of the same bouquet. Here's the larger image and a copy of the original study. I may still make a few minor tweaks to the larger painting before I declare it complete, but think I got the essence of it here. Just a reminder, I'll be signing copies of my book at Frameworks Gallery in Marietta, GA this Saturday, October 19, 2-5PM. A copy of the invitation is below. 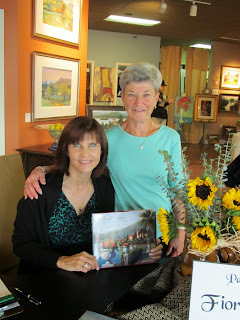 You are welcome to attend the signing and show of select paintings from the book on display at the gallery. If you are unable to attend but would like a copy of the book, click here to order on-line. I'll be happy to sign the book for you, just let me know if you want me to inscribe it to you or to another name if it is for a gift. Please join us for the launch of an inspired new book that will take you on an irresistible visual journey. Author Pat Fiorello will be personally autographing books and exhibiting a number of her featured paintings. Well, now that the 30 in 3 challenge is behind me and I took a couple of days off to refresh, I started on a new series of florals in larger sizes. This one, Elegance is a 20 x 20 scaled up from one of the small studies I'd done last month (Elegance 8 x 8), posted on September 22 . The larger format gave me more opportunity for subtle color changes within the flowers. Well I'm relieved that September is over. 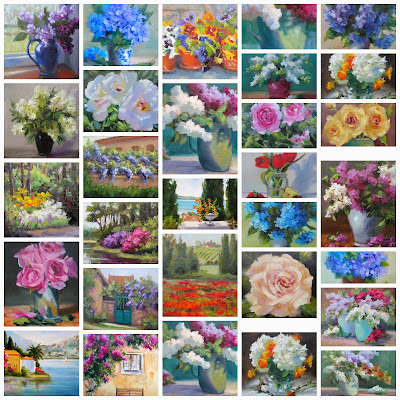 I took on the 30 in 30 challenge to complete 30 paintings during the month along with over 400 other artists all participating on-line and sharing daily via their blogs. Thanks to Leslie Saeta, the sponsor of the challenge and PicMonkey.com, I figured out how to make a collage which includes excerpts from each of the 30 paintings. The challenge pushed me to do more painting, especially since I was traveling for half of the month and had to "double up" on some other days. So I had to get up earlier, work in the evenings when I might normally not have, say no to other things, work on smaller size canvases, figure out how to post from Italy etc...but I saw that it was do-able if I was committed. Since I'd been traveling and dealing with some family issues over the summer I hadn't had as much time to get in the studio as I usually do, so it was a good way to get re-immersed. Also I hadn't been home long enough to go thru my photo's from the France and California trips earlier this spring, so I was able to at least tap into some of those photo's for inspiration and plan to spend some time this weekend going thru them all to see what else I'd like to paint based on those images. After the challenge ended I took a couple of days off from painting, but yesterday got back in the studio seeing how I might translate one of the small 8 x 8 studies into a 20 x 20 canvas. Will keep you posted and share when it's done. Thanks for following along and cheering me on during the challenge. And thanks to all the other artists who stretched beyond their comfort zones to take this on. Hope you learned lots! 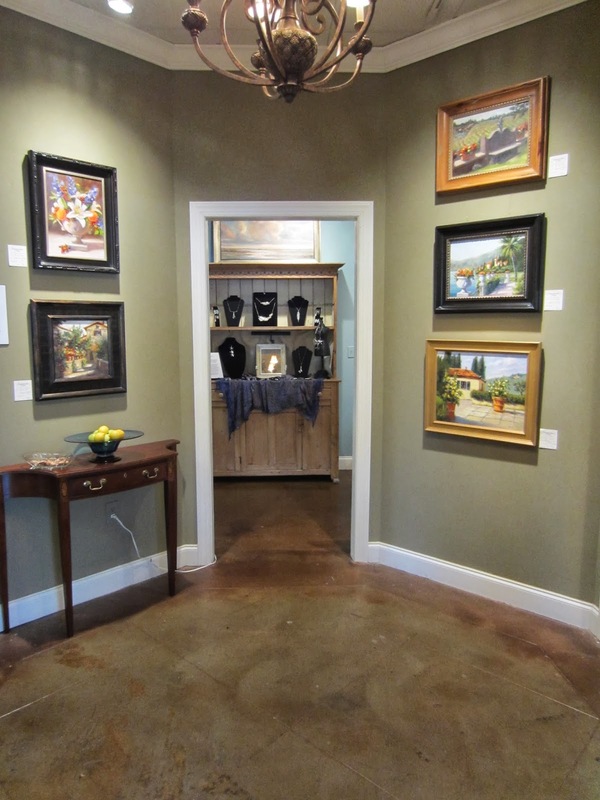 For the past several years, I have had the honor of being the artist for the Dunwoody Home Tour in Dunwoody, GA. 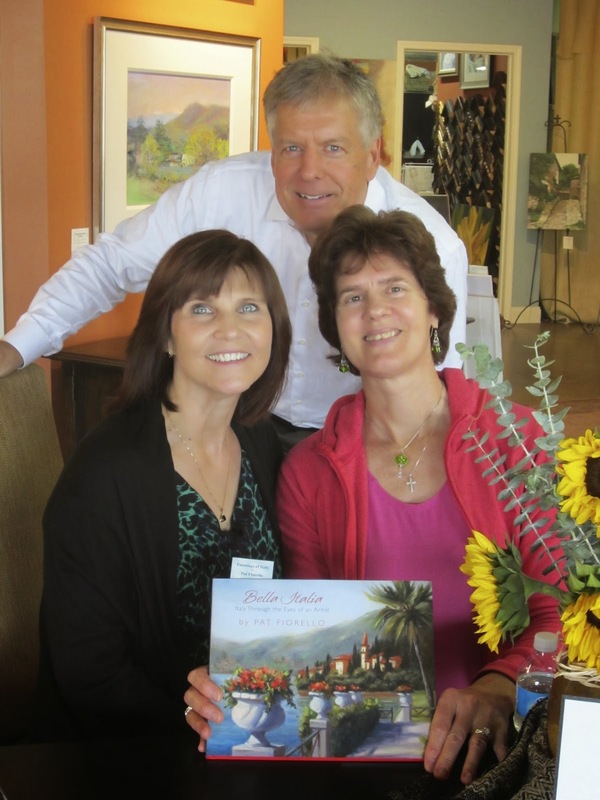 Yesterday I attended the 41st annual Home Tour. Each year, five generous members of the community graciously allow their homes to be on a public tour to inspire others on the possibilities for designing and decorating their homes. 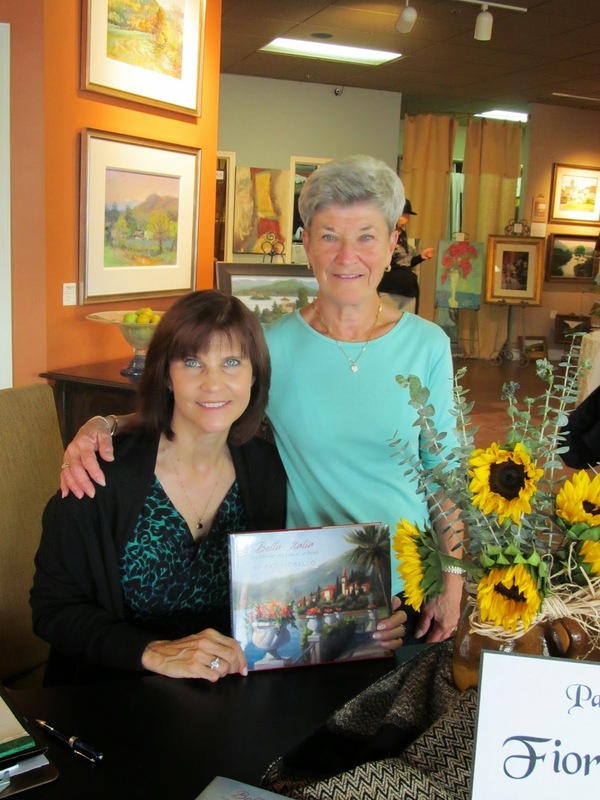 Proceeds from the tour go to support the Dunwoody Women's Club, a service organization of local volunteers who contribute to the community in the areas of conservation, education, home life, international outreach, public issues and the arts. 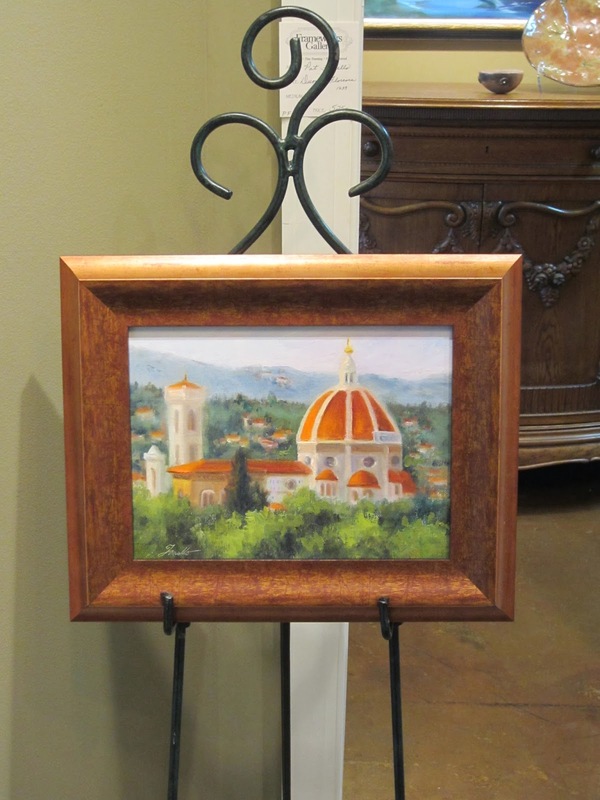 The Women's Club commissions paintings of each of the homes which they then give as thank you gifts to the participating homeowners. 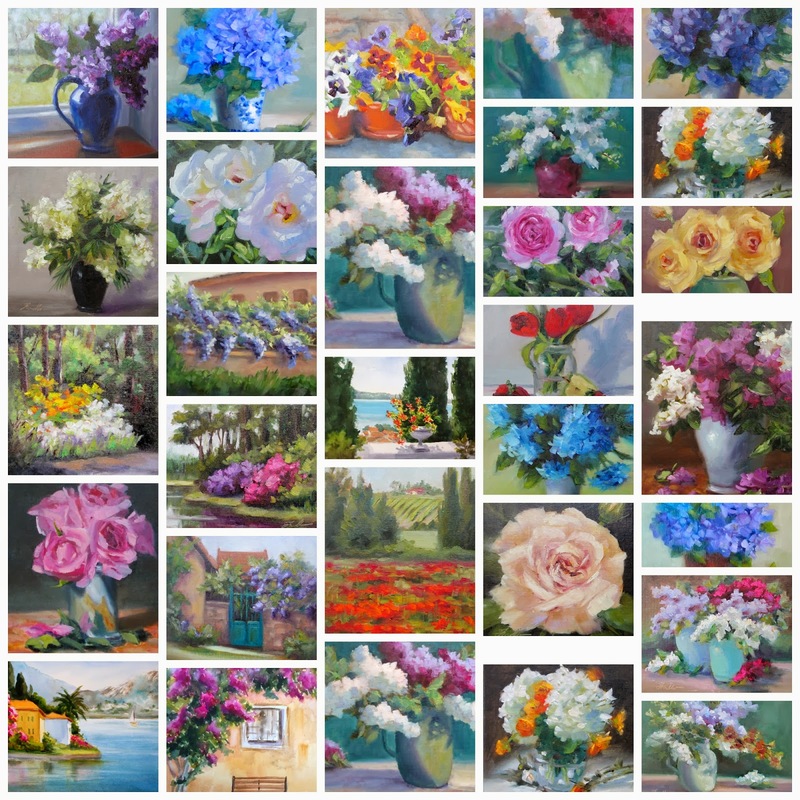 I've included photo's of all the finished home portraits which I did in watercolor as well as a couple of photo's of me taken with the paintings on display at yesterdays' show. It has been a fun project each year working with the wonderful leaders of the Dunwoody Women's' Club and the homeowners to create a special remembrance of their home and participation in this community event. I'm very excited to announce that my new book is now printed and ready to ship. If you've been following my blog for awhile, you know that I have been teaching painting workshops in Italy for many years. Being of Italian descent from all 4 grandparents, I have a special affection for Italy and love to share it's beauty with others. I just got back from teaching a great group of student in Lake Garda in Northern Italy last week. 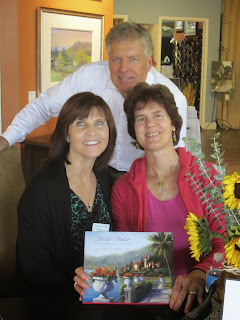 Our mantra for the workshop was "Relaxing into Beauty and Joy" and that was our experience while there. 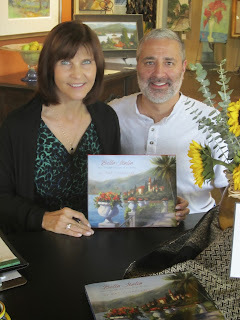 Through this book, I hope to share the beauty and magic of Bella Italia further by taking readers on a visual tour of Italy. The book includes narrative on why Italy is such a feast for the eyes and includes over 80 of my oil and watercolor paintings of Italy done over the years. I hope to bring back fond memories of Italy for those who have traveled there and perhaps inspire those who have not yet gone to include in their dreams for future travel. Let me know if you would like it signed and inscribed for you (or to another name in the case of a gift) and it will be shipped and on it's way to you right away. For those in Atlanta who would like to pick up a copy in person, I will be having a book signing and show of selected paintings from the book at Frameworks Gallery at 1205 Johnson Ferry Road in East Cobb, GA on Saturday October 19 from 2-5PM. Thanks to the many people who played a part in helping me fulfill on one of my dreams by making this idea for this book a reality.